The revised ASME 17.1-2016 was published on November 30, 2016. The changes go into full effect on May 30, 2017. What are the code compliance revisions? Changes were made to reduce the amount of available space between the hoistway door and the car door, eliminating the child entrapment and injury hazard. Car doors are also required to withstand a greater amount of pressure without deforming the door or dislodging it from the tracks, to prevent children from forcibly wedging themselves between the hoistway door and car door. When you design a building or start construction on a new project, safety is always a top priority. With these new code changes, residential elevators are being made safer to complement the active lifestyles of those likeliest to purchase or benefit from them, turning them into a highly sought-after amenity in the next generation of houses and retirement communities. By installing only code compliant elevators, you're ensuring the safety of every person who uses that elevator, young or old. Although the requirements for following the new code will vary by state and local government, adopting compliant equipment in current and future projects can keep you ahead of your competitors. Residential elevator safety has been a subject revisited by the media throughout the years and as consumers become more informed about the codes and regulations manufacturers use to create new safety features, they'll become reluctant to settle for non-compliant amenities. They're not only thinking of themselves, but about the safety of their children and grandchildren. Q. Are builders/architects required to use only compliant elevators? While it's certainly a matter of choosing a safer model of residential elevator, adoption of these new code changes will vary by state and local ordinances. Although your particular area may not enforce the code revisions, savvy consumers and forward-thinking manufacturers are quickly becoming advocates for the safest product available. Q. 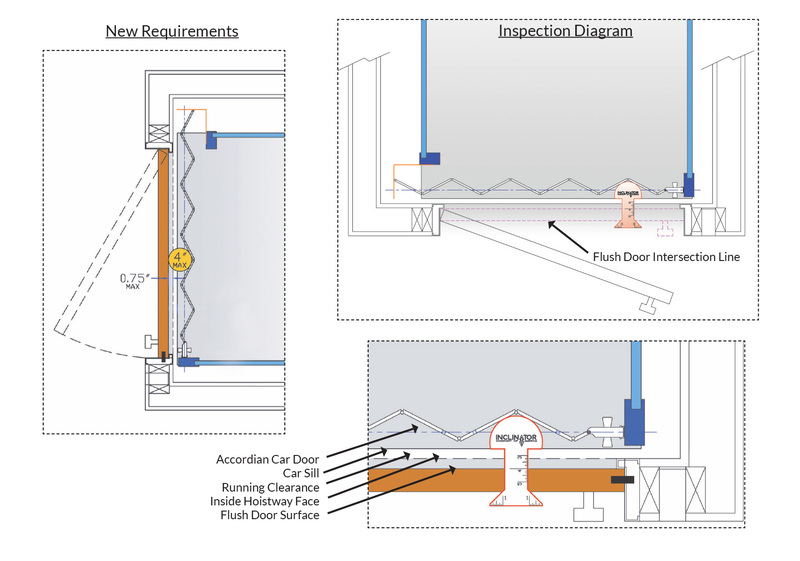 How do I know if the elevator model or installation is compliant? Contacting the manufacturer will give you an indication as to whether they've implemented the necessary product changes to meet compliance. A review of the code changes with the dealer will detail any and all of the relevant dimensions and measurements for installation.